Hatchimals Surprise are Double the Fun + Zuffin Giveaway! | YAYOMG! Hatchimals Surprise are Double the Fun + Zuffin Giveaway! In case you missed Hatch Day last week, you missed some BIG news and a super EGGciting hatchy launch from Spin Master. The delightful new addition to the Hatchimals family have been unveiled – Hatchimals Surprise! Each magical speckled egg comes bursting with an unEGGspected surprise – TWINS! 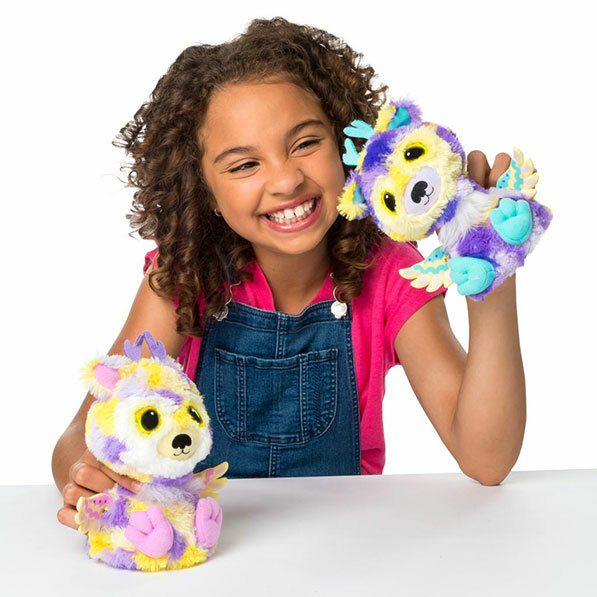 Hatchimals Surprise comes with TWO furry creatures for you to love and care for. You can play with them separately or together, making them a great pick for siblings or best friends who love spending time together. 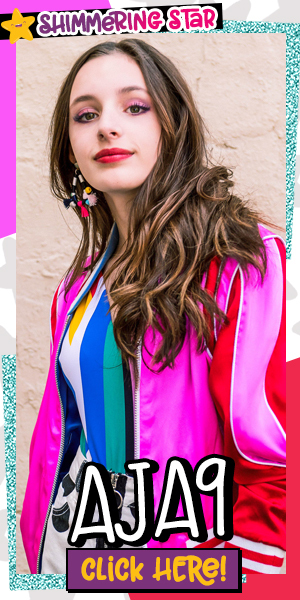 If this sounds like something you absolutely NEED in your life, get excited! We’re giving away the Walmart Exclusive Zuffins to one lucky winner! Scroll down for the entry form, but first – learn all about these super cute new interactive creatures! You may be thinking “weren’t there just new Hatchimals released back in June?“, and you’d be right. 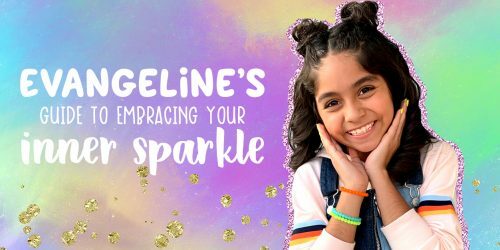 But where they differ is that Hatchimals Glittering Garden line was just a sparklier version of the already existing Hatchimals. Hatchimals Surprise is a real update, bringing a whole lot of new ways to play. There are new species to love, new ways to interact, and the best part – the twins can interact with each other! Hatchimals Surprise brings SIX new species, each cuter than the last. Peacats and Giravens are the new Pengualas and Draggles – they’re the two species that you’ll be able to find at pretty much any retailer. The surprise continues at hatch time when you pull your new friends out of their egg. Sometimes you’ll find identical twins, meaning your Hatchimals will both be the same color. Other times you’ll find fraternal twins, meaning you’ll find two different colored creatures inside. Like last time around, there are also some super special species that can only be found at specific stores. Ligulls are exclusive to Target, Puppadees can only be found at Toys R Us, and Zuffins are exclusive to Walmart. There’s also a second Target exclusive, Deerioles, which will be released closer to the holidays and in our opinion, they’re the cutest of the entire bunch. While each of these new species are mashed up with birds like the original Hatchimals, they take on more of the appearance of their other half. As you can see, Peacats are much more cat than peacock, Ligulls are much more lion than seagull. We loved how this makes them stand out from the originals. While adorable, a lot of the original Hatchimals looked pretty similar, and each of these new creatures looks totally different from each other. Hatchimals Surprise aren’t the only new species finding their way to Hatchtopia. 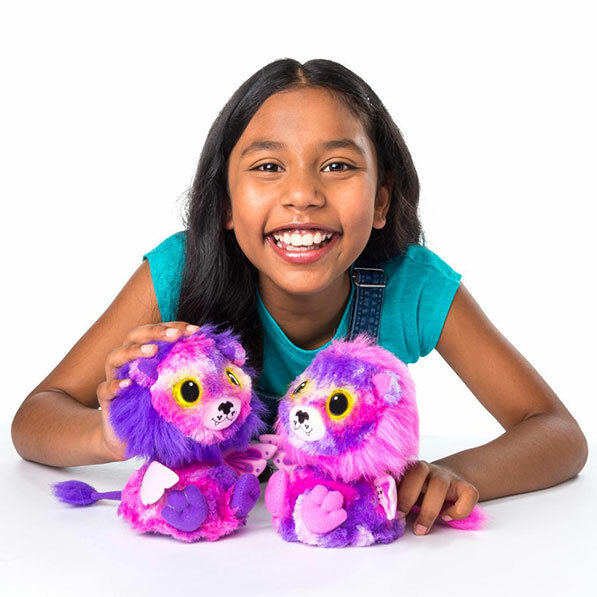 The original Hatchimals line will see Tigrettes and Puffatoos in December. Obviously picking the cutest Hatchimal is crucial, but once you bring it home and get it hatched, that’s when the real fun begins. The good news? We hear that hatch times are much shorter this time around. 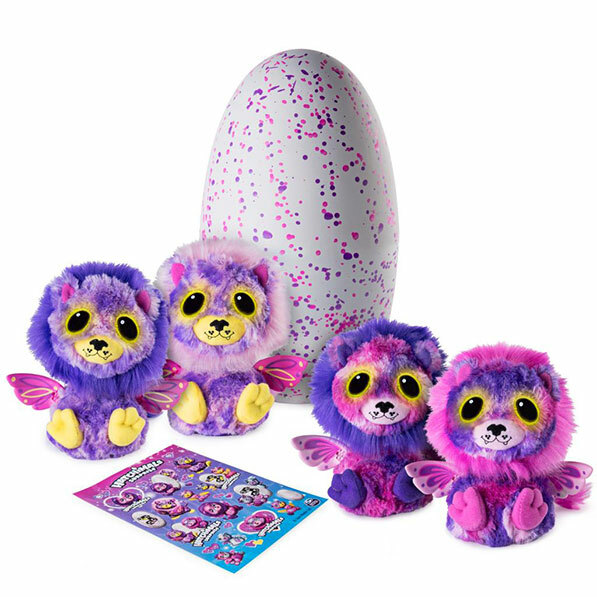 Spin Master said that Hatchimals Surprise eggs begin hatching in as little as 7 minutes, which is awesome. The quicker hatch time isn’t the only thing that has changed. The eggs are larger (since there are two Hatchimals inside) and they burst out the top of the egg, much like a real animal would. You can interact with and care for your Hatchimals Surprise in all the same ways as before, but there’s also lots of new ways to play. As you nurture your new friend from baby to toddler to kid, there’s something new for them to learn and something new for you to do at each stage. We don’t want to spoil all the fun, but there are lots of new surprises to discover. 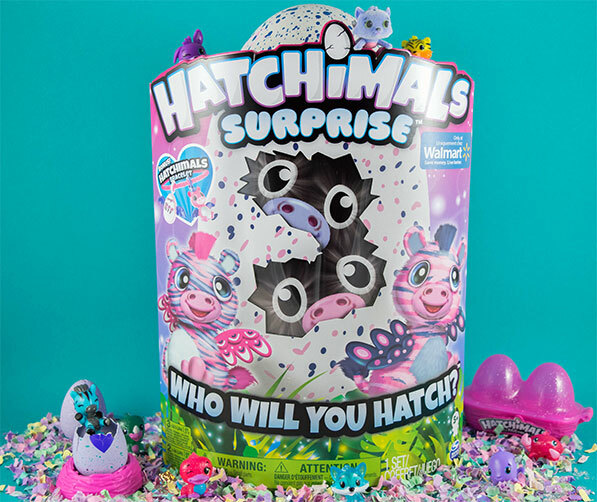 Each of your Hatchimals Surprise twins has a completely different personality. One of them, usually the first one hatched, will be the chatty one, able to record and repeat anything you say. The other will be the more musical one who loves to move, dance, and wiggle! They’re able to interact not just with you, but with each other! When one twin sings, the other will start to dance, and they can even say “I love you!” to each other. Your new twins love to tell each other jokes, play games, and even bicker like real siblings! Don’t worry though; they’ll be back to loving each other in no time as they get sad when they’ve been separated for too long. Hatchimals Surprise cost $69.99, which is $10 more than the original Hatchimals – not a bad price considering that you get two! While we are finding that some of the exclusive species have been selling out, we have noticed that the Peacats and Giravens have been in-stock at plenty of retailers, both online and in store. This means that you shouldn’t have too big of a problem picking one up, whether it be for you or as a holiday gift. 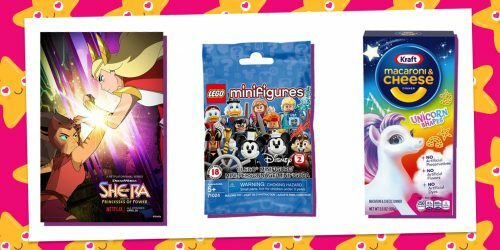 – One (1) lucky winner will receive the Walmart Exclusive Zuffins Hatchimals Surprise! *This is ONE prize, but there will be TWO creatures inside when the egg is hatched. *Hatchimals CollEGGtibles featured in the image are for decoration only and are not part of the prize. Get permission from your parent/guardian and fill out the form below by 10/25/17. 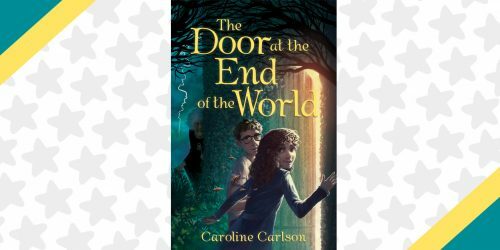 Giveaway begins on October 11, 2017 at 4pm ET and ends on October 25, 2017 at 11:59pm ET. You must be 18 or older to enter. If you are under 18, you’ll need to get permission from your parent/guardian to enter and again if you win. Please provide THEIR email address when entering below. If chosen as a winner, you’ll need to provide contact info where we can reach your parent/guardian if you win. They’ll need to sign an affidavit permitting us to send your prize. Be sure to read the fully detailed rules HERE before entering. We love Hatchimals, but we’re also super into squishies right now. Check the new Gross Desserts line of Soft’n Slo Squishies!